AVALANCHE may not mean anything to some players, but those familiar with role playing history will immediately recognize it. After all, it is the designation of the rebel group in the memorable Final Fantasy VII and now also the name of a fan-made free action game. Something to keep us entertained until Square Enix greenlights a remake? It will arrive, for certain, but when? Anyway, AVALANCHE really is more action than RPG. It’s a beat’em up with a few role play touches but what stands out are the characters: Tifa, Cloud and Barrett. It takes place after the events of the first game in the Final Fantasy VII series. It has come to light that a hidden mako reactor continues to operate, now outside of the control of ShinRa. 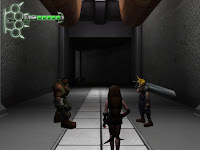 Cloud, Barrett, and Tifa take on the task of stopping the reactor, with Rufus gone missing. The player takes on the role of Tifa, with a large arsenal of special attacks and unique items at their disposal. AVALANCHE is a third-person action game featuring not only characters but also environments seen in Final Fantasy VII. Music is courtesy of the great Nine Inch Nails and Final Fantasy VII: Voices of the Lifestream, a remix album containing free fan arrangements from the soundtrack of FFVII. The game even supports Xbox 360 and PS2 controllers, proof that a lot of care went into the production. But this is a heavy heritage and AVALANCHE needs to have more to it. Luckily, as far as free games go, this is a nice homage to the universe that inspired it. Mostly a dungeon crawler, it requires us to defeat enemy after enemy to upgrade our abilities and go searching for more trouble. It’s a challenging game that begs for extra care and constant trips to the ‘shop’, but making Tifa more powerful and seeing her unleash special attacks is a real joy. The environments are quite interesting although lacking in detail, but the visuals and characters are nice as it is. There are some collision detection problems, something that has destroyed many a brawler, and AVALANCHE suffers a bit from it. However, the biggest annoyance is the manual camera, forcing the player to adjust it all the time, even during some of the most taxing fights. The chosen font isn’t exactly clear, so get used to squint a little during dialogs. Besides the challenging single player mode there’s a multiplayer but only through IP. AVALANCHE is a game made by fans for fans. It’s not your typical throwaway game where you play 10 minutes and it’s done. Players will need to be persistent to help Tifa and her friends but they won’t regret it, specially the die-hard Final Fantasy fans.